com’eco d’un grido che fu. seemed intent on looking on. the echo cries from long-ago. The poem L’Assiuolo by Giovanni Pascoli was first published in the journal “Marzocco” in 1897. It would later become part of the famous collection of poems called “Myricae”. 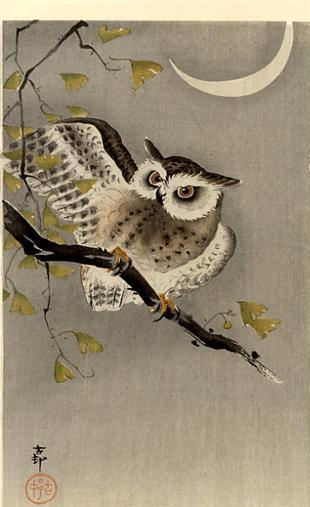 The title of the poem takes its name from the nocturnal bird, the scops owl. The hoo, monotonous and sorrow-filled, is repeated at the end of every stanza. Nature and darkness dominate the atmosphere. Through a rapid succession of images, inspired by the sounds in the night, we uncover the poet’s feelings. The initial serenity becomes more and more mysterious and unsettling, terminating with the thought of death. The mystery of death is, as always present, as is the loss of his loved ones, and the grief that follows. The theme of mystery is created by the use of words such as pearly dawn, sighed breath of wind, black of clouds, misty milky fog etc. and ends with the greatest mystery of all: death. As always the translation was slow and laborious. Sometimes the rhythm was off. For the very first time, I was helped by the most musical member of my family. He strummed and sang the verses, and the kinks were ironed out, I hope, nicely. M.C.